Take in the sights of the Grand Canyon from the trail on some of the park’s best short hikes. 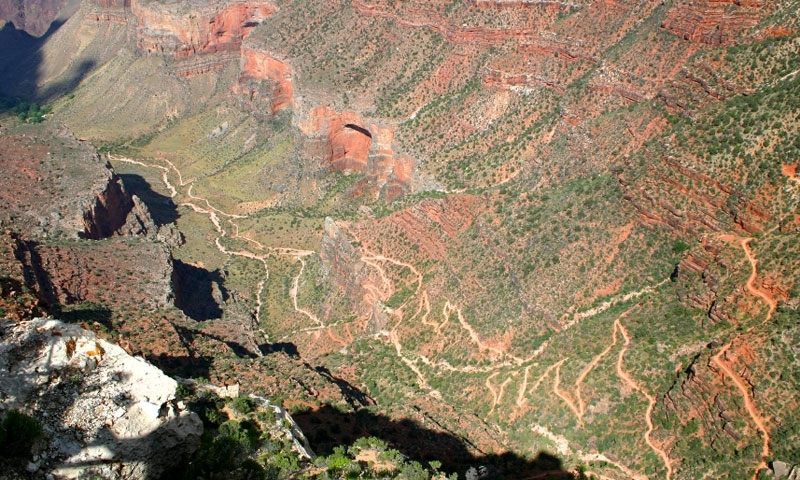 The Grand Canyon has several hundred miles of hiking trails. Whoa, that's quite a few miles to cover in a couple of days or even perhaps in a lifetime. However, if you're going to be there for a day or two and only have time for a couple of short hikes, and need something that is not physically demanding, something that the whole family can enjoy, which trail do you choose? Here, is a brief overview of some of the best hiking trails on the both rims of the Grand Canyon. One of the most popular trails in the park, and one of the most beautiful, the Bright Angel Trail combines scenic vistas, a well-groomed trail, and a shady rest house. With its location just below the rim of the Canyon, it gives hikers an opportunity to feel and appreciate the dimensions of the Grand Canyon. The trailhead can be found near Tusayan. This hike will take you the better part of a day, but it is well worth it. The trail offers dramatic vistas, a variety of flora, and ends at a spring that “drips” water. However, be aware that this water is contaminated and should not be used for drinking water until it has been treated. The path to Dripping Spring - also the first part of the Hermit Trail - begins at the end of a short track from Hermits Rest, at the far end of the West Rim Drive. If you only have time and energy for just a few short hikes, make sure that you put Shoshone Point on your to do list. This easy walk combines a walk through cool pine forest with dramatic view of the Eastern Grand Canyon. Although most of the South Rim viewpoints offer easy and short (yet often crowded and noisy) hikes from their paved parking lots this particular hike allows you to enjoy some solitude. The trailhead for Shoshone Point can be found about four miles past Mather Point. Many of the easier, family friendly short hikes start at the Grand Canyon Lodge. These first ones are excellent to take your family on, even small children. However, watch the little ones, because there are sections of areas where the footing may be a little loose and it would be easy to fall. Grab some of the self-guiding nature trail pamphlets found from a box along the trail and learn as you go. Beginning at the log shelter in the parking area by the visitor's center, this short hike on a paved trail takes you to a spectacular view of the canyon. Another family friendly trail, this trail is a little longer, but provides some great views of the Grand Canyon as it follows the canyon rim from the Grand Canyon Lodge to the North Rim Campground. Take it in either direction. If you are camping at the North Rim Campground, it is fun to take the family to the Lodge for lunch or a little browsing in the gift shop and then head on back to your campsite. One more trail, family friendly and beginning and ending at the Grand Canyon Lodge is the Bridle Trail. A short trial, it follows the main Park Road. This is a hard packed trail that allows not only walkers and hikers, but also pets on leash and bicyclers. If you are feeling a little more ambitious and your children are older and up to the task, you should try the following hikes. This can be a fun hike, because the trail is often shared with mules that are transporting visitors to and from the bottom of the Canyon. The path meanders through the forest to an overlook with a great view. You can catch this trail at its beginning at the North Kaibab Trail parking lot. You can travel a little ways by car and then get out to stretch your legs and let the kids run off some of their energy. To get to the trailhead, take the dirt road ¼ mile south of the Cape Royal Road for 1 mile. Park your car here and pick up a self-guiding trail brochure. This trail is one of the best for its blending of forest scenery and canyon scenery. The trail is one of the longer ones, but there is nothing to prevent you from going part of the way and then returning to the trailhead. Even a short walk here can be very enjoyable. Though the following hike would be rated by most hard-core hikers are extremely easy, it really shouldn't be missed. Found at Roosevelt Point, this very short hike offers some of the most spectacular views of the Canyon. There are even benches on which to sit and take in the splendor that is laid out before you. Well worth the walk for the relaxed enjoyment it offers. The Grand Canyon offers some of the most rugged and strenuous hiking anywhere in the United States. Even if you are planning to take any or all of the hikes listed here, make sure that you and those individuals going with you are well prepared.